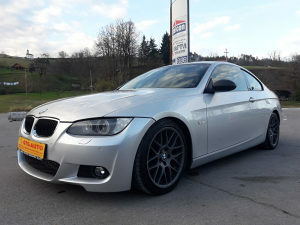 BMW 320 D E92, 130 KW, 2007 G.P ! JAKO ATRAKTIVAN AUTO, SA M OPREMOM. VOZILO JE U PERFEKTNOM STANJU, MAKSIMALNO JE UTEGNUTO I ČUVNAO KAO ŠTO SE VIDI I NA SLIKAMA, POSJEDUJE M OVE BRANKE, SPOJLER, ALU FELUGE I JOŠ MNOGO TOGA. POSJEDUJE KOMANDE NA VOLANU, DIGITALNU DVOZONSKU KLIMU, TEMPOMAT, PARK SENZORE, I JOŠ MNOGO TOGA ! TEK UVEZENO I PLAĆENE SVE OBAVEZE DO REGISRACIJE !